The close link between the financial sector and the real economy is the main reason Frankfurt is emerging well from the financial crisis and the bedrock on which the centre's success is built says HUBERTUS VATH. Frankfurt is now positioning itself as a centre of excellence for risk management and regulation which can be a starting point for Frankfurt to partner with, and advise, up-and-coming financial centres from Asia, South America and Eastern Europe which will lead to further growth for Frankfurt's financial centre he says. 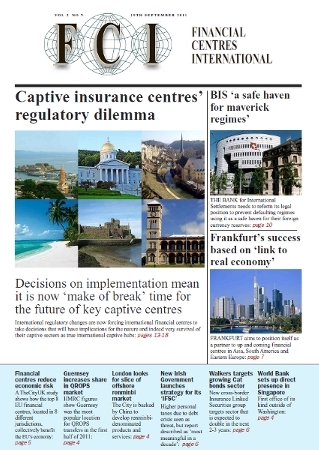 The enactment of the Insurance Law 2010 will create new categories of licences including sub categories for captive insurers depending on the extent to which net premiums written originate from related business of the insurer that will further reinforce Cayman's position as an insurance centre says TIM FRAWLEY. Two new licences categories will cater for structurers of insurance-risk securitisation products and for reinsurers making the centre even more accesible to this type of business he says. Bermuda, the world’s third largest insurance centre and the world’s largest captive insurance centre has decided to seek equivalence with the EU’s Solvency II regime. However, the treatment of captives under Solvency II is still unclear, creating uncertainty for the Bermudian captive insurance industry.